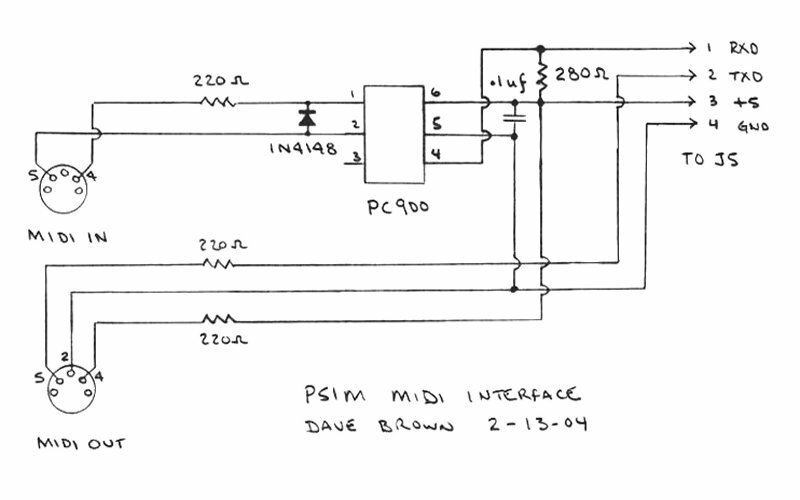 The original PSIM was a Frac module with simply four analog inputs and outputs, three digitial channels with switches, and 6 LEDs. I expanded my PSIM module wth MIDI input, MIDI output, SpeakJet, and CV controls normalled to a +10 volt reference for each of the input channels. Later I added a 1U companion LCD display. This became the inspiration for my open source 8 channel precision ComputerVoltageSource module. I combined switches for the PSIM and SpeakJet. Up (blue legends) control the SpeakJet and down control the PSIM. I upgraded my SpeakJet interface from the original software controlled serial interface to an I2C interface with a TTS256 to make programming easier and compatible with interrupts. This photo shows the original SpeakJet interface on the left. The +5 volt regulator for the PSIM has been folded down with a heat sink to lower the case temperature. The MIDI input and output module is barely visible in the middle with the cv controls. I got a surplus 2x20 vacuum fluorescent display module from Noritake Itron which supports scrolling, four brightness levels, and user-definable fonts. 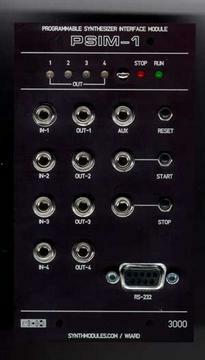 It interfaces with parallel or serial up to 9600 baud. I used the PSIM Aux for serial output to the display but the two 10K series resistors limited the current so I had to buffer it with a single transistor. I had to use the software serial command which is not compatible with interrupts. A follow-on project to this VFD display was my External LCD module. This significantly reduced power from the 400 mA that the vacuum fluorescent display requires. I changed the interface to the display to use a MIDI sysex command which eliminated the Aux output issues of current and interrupts. I built a similar version into a 1U PSIM Display module using a 2 line x 8 character LCD display. I modified this design for the ComputerVoltageSource LCD and now use this as my standard display. I use the display for program names and to indicate control selections, modes, and input and output voltages. Programs that used the smaller 2 line x 8 character LCD just utilize the top line of the 2 line x 16 character LCD.